This trek has the most ancient and most beautiful forest trails. You get to see a spectacular view of the forests. Last but not the least, in this trek mountain views are what die for. You will see superb mountain views from the starting of this trek. The trek is tough during January and February. Camping and staying in comfortable tents. Experienced leaders will guide you through this trek. Kuari pass trek is one of the best trek in Himalaya for the beginners as well as for regular trekkers. 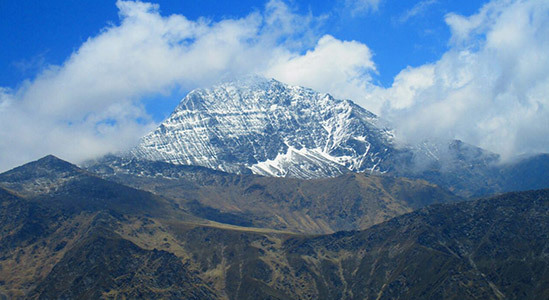 This is one of the most preferred treks in Uttarakhand by those who want to explore the Himalaya. This trek will cover with snow most of the months so good for those who want to trek in snow. It is said that it was untouched pass or trek till that time when Lord Curzon came here and he given it a name Kuari which mean untouched (it’s a saying).also known as Lord Curzon Trail. This trek will give you a wonderful view of Garter Himalaya, Nanda Devi Mountain, Trishul, Chaukhamba, Dronagiri, meadows and beautiful forests. This trek also covers remote villages of Uttarakhand so it is also an opportunity for those who are not aware of the culture of Uttarakhand. Kuari pass trek is an easy to moderate and best for beginners. Highest altitude in this trek is 12,516 Ft.
As we described above Kuari pass trek is the best trek for beginners so if you are planning to trek first time just choose it without any doubt. This trek includes everything what a trekker want to see in the trek like Himalaya range cover with snow, endless view of meadows and forest which have enough verity of trees. Every day you will experience a new landscape. The voyage to the brilliant goal Kuari pass will begin from Joshimath, a town in Chamoli District in the Indian state of Uttarakhand. Situated at a stature of 6150 Ft. it is an entryway to a few Himalayan hiking endeavors, trekking trails and explorer focuses like Badrinath, the hypnotizing sees. While coming to Joshimath, you will go by the Panchprayag or the five blessed junctures of Ganga—Devaprayag, Rudraprayag, Karnaprayag, Nandaprayag, and Vishnuprayag. Along these lines, keep your cameras to capture the beauty of mountains. Morning in the lap of Himalayas will fill you with enthusiasm, and you will start your trek today from Joshimath to Dakh to Gulling top, after breakfast. You will begin from Joshimath in the steep ascent you will witness the giant mountains in front of you, and the most pampered mountain which is known as sleeping Lady Mountain, the creation of God is just amazing. It seems like a lying lady, with this fantastic view we will trek further to reach our destination, wherein we will cross from the Tugasi village, you will see the culture and tradition of mountains. The trek may feel little tiring because of the rough path but still wait for the view you will witness later, after approx 20 to 25 min of trek you will reach Kharchi village where you can fill your water bottles and take rest for some time. Continue walking on the path again you will witness the outstanding Dronagiri peak that will make your heart go numb and later we will reach the Gulling top, home for the day. Last day trek was little tiring in the rough path, but today, the trek will be smooth with not too harsh way, and you can treat yourself with the beauty of Himalayas. It will be approx 5 hrs journey today, deep into the forest almost after 20 min of the trek. You will reach the green wood by overlooking the snow peak and that greenery will boost up your mind and soul. The peaceful area fringed with oak and rhododendrons trees, and if you choose this trek in March, you can find the charming beauty of white and pink blossom, later on, you will see everything coated with the snow from trees to land seems like a paradise. The more profound you will go into the forest you will find the shadow of conifer forest of Gulling, and with Donagiri peak your eyes will embrace Hathi Gori peak along the way. Your patience will give you the best result today, as it will be your summit day. It would be better if you will start trekking early for Kauri pass as it may take 10 to 11 hrs depends on the speed of the trekkers, and must remember you will not get any waterway along the way so bring enough for yourself, you will trek to Kauri pass via Khullara top – a moderate ascent of 3.5 Km today. The trek will be a little hard as you will pass by broken bridge, frozen stream followed by ridges that will make the trek little tiring but that is just the first side of the picture, highlights are still waiting to blow your mind when you reach the top, the spine-tingling view of the mountain peaks such as Kedarnath Peak, Kedardome, Chaukhambha, Balakun, Neel Kantha, Mukut Parvat, Kamet, Abhi Gamin, Mana I, Ghori Parvat, Hathi Parvat, Dronagiri, Kalanka, Changabang, Nanda Devi, Nanda Ghunti will be the eye-pleasing therapy. As the last day was so pleasing and awe- inspiring, you must have kept all the memories close to your heart to cherish them your whole life as Kauri pass trek will end this day and you will find your way back to Joshimath via Auli where on the way you can capture the beauty of Auli too, that is so wonderful ad unusual and will make your whole trek the best of all the time. 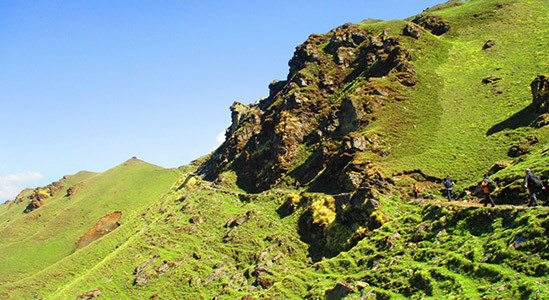 Kuari pass trek is as easy to moderate trek so this is the best answer for beginners. This trek will give you everything what you expect in a trek like Snow, - zero temperature, meadows, forest, river, valleys, The Great Himalaya and its endless range, beautiful views of Nanda Devi, Dronagiri, Chaukhamba, Neelkanth. 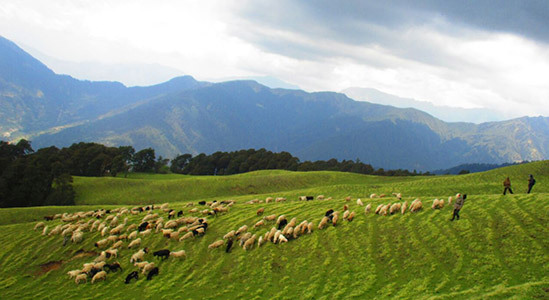 You will find a glimpse of Uttarakhand culture while trekking. Trekking Kuari pass, no doubt, is one of the most thrilling adventure one could ever have in his/her life. With an elegance of nature and unmatchable experience of the pristine mountain ranges, trekking stands out among all the adventures across the world, but nothing comes free, there are certain aspects of the trekking which one needs to consider while he/she is making up his/her mind for trekking. Here’s a list of some basic requirements which one would need during his/her camp trekking. Let’s pay some heed to these requirements for trekking. Three warm layers: On high altitude treks Kuari pass, temperature after the sunset drops to the considerable degrees. So, during these campsites, you might need an additional layer along with the padded jacket coupled up with a fleece and a warmer. Sun cap: The sun feels brighter and nearer at high altitude treks like Kuari pass. Used sun caps to save your neck and face from sun Burns, Especially if you are trekking at the end of the day. Trekking on Kuari pass is a different kind of adventure where you required to be physically and mentally prepared for the best and worse, at the same time. While high altitudes treks making it tough to breathe, the beauty of those pristine mountains leaves you speechless so that you forget to breathe for a moment or two. In addition to the physical and mental preparation, there is a certain aspect of the health that is needed to be considered on the first hand when you make up your mind about the trekking at Kuari pass. Trekking at Kuari pass demands endurance and fitness and those who suffer any kind of physical or physiological ailments are advised not to go for high altitude treks in the beginning. To get assurance about the trekker’s fitness, we comply with certain aspects of the being fit such as BMI (Body Mass Index) along with the fitness proof since we can’t put the trekkers into the risk. Monitoring the health is one thing that is conducted regularly during the Kuari pass trek by the trek leaders which includes the monitoring of your blood pressure, oxygen level and pulse rate. Details of your health during the trek is maintained in the health card on the regular basis. Health card can be collected from the trek leader at the end of the trek. Trekveda provides you all the necessary equipment for trekking at Kuari pass from tents to ropes. In addition to that, our trek leaders also ensure the safety by various safeguards they take from time to time for your safety. Microspikes are provided to attach to your shoes which help you to keep the traction on the snow and make it easier to climb. An additional gaiter is provided to cover the snows which prevent the entering of snow into the shoes. Customized tents are provided to the trekkers which ensure the warmth and temperature 10 degrees higher than the outside coupled up with high-quality sleeping bags which can endure the temperature up to 15 degree Celsius below the freezing point. Trekveda, keep all your nutritional and hydration requirements on its checklist, our trek leaders will guide you to keep your body hydrated on the high altitudes Kuari pass trek as de-hydration can attract to the severe medical emergencies while trekking. What Trekveda has to offer in case of medical emergency? Problems like Acute Mountain Sickness can prove fatal at Kuari pass if not taken into consideration seriously on time. If you face any of the symptoms such as a persistent headache, fatigue or weakness, nausea, dizziness, loss of appetite, difficulty in sleeping, you shouldn’t let it go or treat it by your own either just inform your trek leader. Difficult treks are more adventurous than easy ones. But going on some High-altitude trek like Chadar without calculating its risk is utter stupidity. Safety of our trekkers is on our highest priority list and we do everything to ensure the safe and enjoyable trek. The Dehradun station is one of the principle stations in the area and it is an old station. It has great availability to numerous spots and these incorporate Lucknow, Delhi, and Howrah. Tickets from Delhi to Dehradun via train cost around Rs. 150 for an inferior sleeper ticket and Rs. 400 for a third A/C sleeper ticket. There are 19 different trains available between Delhi to Dehradun. Nanda Devi, Jan Shatabdi, mussoorie express and Dehradun express are the best options among them. Normal transports employ from Kashmiri gate Delhi to Dehradun. You can get a flight between new Delhi to Jolly Grant. Distance between the Jolly Grant to Dehradun is 28 Km. It will take half hour drive to reach Dehradun. Would recommend you to take just government transports from Kashmiri gate Delhi. Private transports handle from outside ISBT and they are not confiding in value. Shared Taxis or comparable vehicles will get you from Dehradun Railway Station at 6:00am. Kuari Pass Trek is moderate type trek which is suitable for beginners if they have at least 2 months physical and mental conditioning. However, even being a moderate type trek, proper study of the trek must be made. Trekking at Kuari pass, for its ever-lasting memories and experience, demands just a few things which involve physical endurance with physiological wellness. Not just the one who’s physically fit would do the magic in trekking but one also needs to be mentally fit as well in order to cope up with the adversities one might have to face during the treks such natural calamities, rains or other unforeseen conditions. Getting to the Kuari pass trek without proper preparation is something you should never do. Cardiovascular exercise is one of the most sought-after methods which provides not just the physical endurance but also the strength to withstand any unavoidable circumstances sternly. Trekking at Kuari pass demands the high endurance which you can develop in a month or two where you need to begin with the jogging or running (only if you could do). This practice needs to be combined with the speed and distance targets. You need to keep on increasing both with the time. Another vital area of improvement, you need to work upon. Before you head to the Kuari pass trek, you need to have the physical strength in order to carry backpacks on the uneven terrains. Considering everything under the sun, you ought to prepare yourself for the core strength. A strength would be making you suffer less than others who don’t prepare before it. To pacify yourself or any other companion, yoga and meditation are the keys. These practices not only give you the mental peace but also provide you with a placid inner conscience which is extremely important in order to withstand the cons during the Kuari pass trek. The trek expense of Rs. 9,200 + 5% GST takes care of all expenses of the trek from Salbagar to Joshimath. Backpack offloading charges - If you wish to offload your backpack, there will be an additional charge of Rs. 1200 + 5% GST. The backpack cannot weigh more than 9 kgs. Suitcases/strollers/duffel bags will not be allowed. Please note that charges will vary for last minute offloading in case you decide to offload your bag after reaching the basecamp (Rs. 1400 + 5% GST). Online offloading in advance is possible up to two days prior to the trek start date. Buffer day – It is mandatory to have this extra day as any bad weather or rain will delay your pass crossing. If buffer day is utilized, you will need to pay Rs. 1,740 + 5% GST. This amount is to be handed over to your trek leader. What is the average Kuari pass temperature is? The temperature of Kuari pass trek in winters remains 10°C to – 8°C in the night, While on summer the temperature remains from 18 °C to -2 °C. Why is it called Kuari pass trek? It is said that it was untouched pass or trek till that time when Lord Curzon came here and he given it a name Kuari which mean untouched. Why Kuari pass trek is famous? Kuari pass famous for its charming forest. While stunning meadows and streams lining the trail will surprise you with its beauty. What is the height of Kuari pass Trek? The Kuari pass height varies with every phase you pass as your approach the Kuari pass trek, you will acclaim a height of around 12,516 ft.
What will be the base camp of Kuari pass trek? Trekveda makes it's basecamp at Salbagar. This is one of the most beautiful places that leads to you to the pristine areas while letting your relish the vibrancy of nature. How do we reach Salbagar? Our basecamp would be at Salbagar. There are direct buses from Haridwar, Rishikesh and Dehradun. The stay will be in the tents which will be provided by the Trekveda. Each tent will be shared by three fellow trekkers however special arrangements can be made on request. A separate tent will be assigned as the toilet room at each campsite. Yes, you can take your child on Kuari Pass trek, but the age limit is above 12. The best season to see the snow on Kuari pass trek is the winters where you can see a lot of snow-clad you can also witness the fresh snowfall at heights if the climate is favorable. 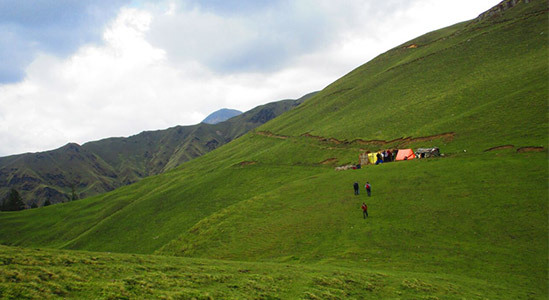 Kuari pass trek is considered as easy to Moderate trek. Your basecamp Salbagar will be your starting point and ending point will be Joshimath. The sloppy ice treks on Kuari pass trek make it difficult to walk. You can’t risk taking the preparation for physical strength prior to trek for granted as it may cost you losing your best trek experience. No, Starting and ending points are different. No, there is no acclimatization day on this trek. The minimum age limit for this trek is 12 years old. Yes, a separate tent will work as a toilet. However, you’re advised to maintain the hygiene by using the biodegradable disposable toiletries and keeping the sanitary napkins and other stuff in separate zipped bags. But you can get trekking Shoes and other equipment on rent directly from the marking in Sankri. Returning to the home with the mystical memories would probably be the best feeling after the trek. Your Trek will end at Joshimath. 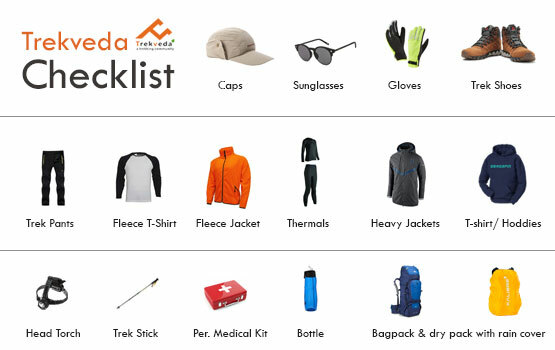 What will be the total expense for a Kedarkantha trek? The total expenses of the trek will be INR 9,200 per person. In addition to that, an addition of 5% of the GST will be levied on the total cost.